The afternoon before the much awaited Pacquiao vs Marquez fight (November 12, 2011), I took a 2-hour “power” nap to ensure that I have the right amount of energy. The group watched in “Congressman” and “Donya Gracia”‘s place. The booze and the food were overflowing! And some were already drunk when we arrived. 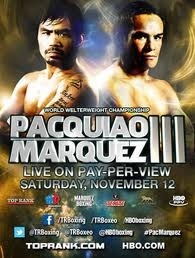 The Pacquiao vs Marquez match started at around 11p.m. (Central Time). I must admit, it’s my first time to watch a “real-time” Pacquiao boxing match and I was taken aback when it was over in a split second. I have gotten used to watching delayed telecast loaded with endless TV commercials which prolonged the agony of waiting for the bout to finish. Pacquiao won but I’m sad. 😦 He was not in his winning form. Marquez has that “it” factor to win the game. 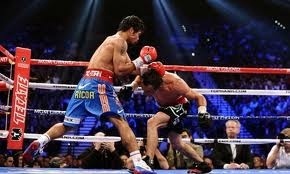 Nonetheless, the judges were not convinced on Marquez performance. Knock out is the key… in which, it did not happen. Better luck next time! The fight maybe hounded with controversy, but let’s face it, the judges made the decision. They must have seen something that we did not see on our television screens (no matter how gigantic the TV is). So, what did I get from watching the fight? most of all, a great bonding with the group! 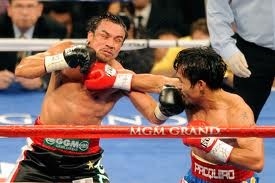 Will I watch another Pacquiao fight next time? If he will be fighting Mayweather, I will. Otherwise, I’d rather sleep. Too much excitement is not good for the heart. Ha!